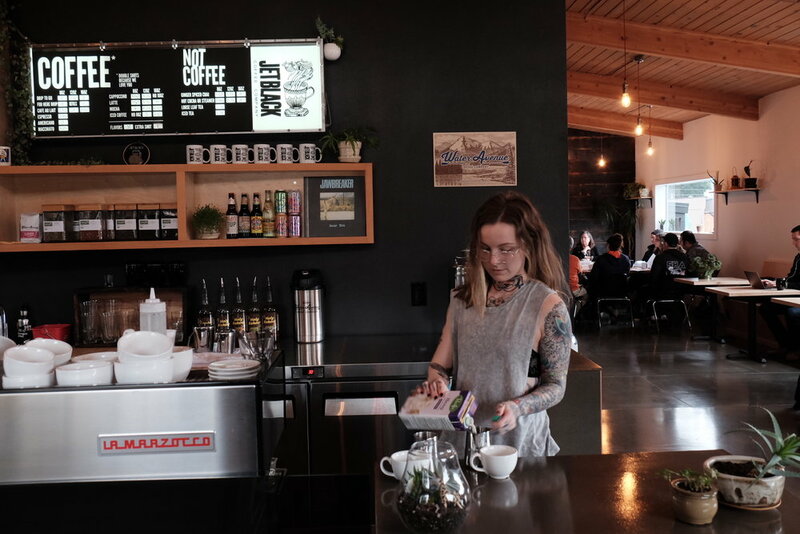 Welcome to Jet Black Coffee Company in Portland's Gateway District. We are located beside Food Fight! Vegan Grocery. We serve coffee to our friends (even ones we don't already know), play music that our friends like, and try to keep our plants from dying... again, for our friends to enjoy. In fact, our story begins with music and friendship. We are Karla and Travis and we are great friends. We both hail from the Southeast but the Pacific Northwest is a place that we both love and therefore reside. Music is everywhere in our café. 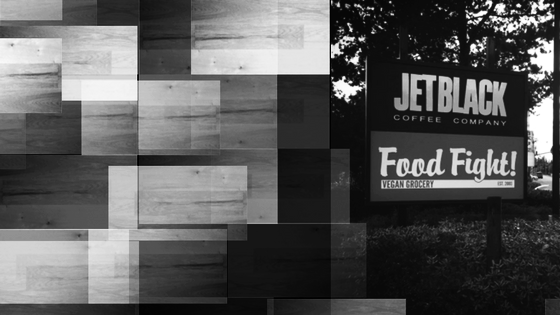 So much so that Jet Black’s name comes from one of our favorite bands, Jawbreaker, and there are subtle nods to the band throughout the café. We even collaborated with our friends at Water Avenue Coffee Company to create a custom blend that shares a name with the album Dear You. Some of the walls at the café are indeed jet black, but overall we have a great space for you to enjoy with high ceilings, bright windows, beautiful art, and thriving plants to bring a life and warmth to the space. All that's missing is you. We hope to see you early and often. Thirsty? We serve COFFEE drinks and also drinks that are NOT COFFEE, like Tanglewood Beverage's Ginger Spiced Chai. We are all plant based and serve coconut, hemp, almond, Oatly, and soy milks. Hungry? Delicious pastries and baked goods are available from our friends at SWEET PEA BAKING COMPANY, SHOOFLY VEGAN BAKERY, and BACK TO EDEN BAKERY (gluten free).